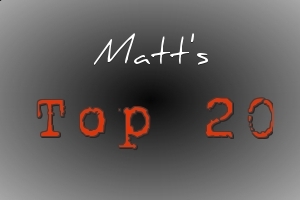 Don't forget to read the qualifications regarding how my top 20 is chosen. (For those that are too lazy to click--see directly below for a brief description) You can also see the albums that just missed my top 20 in the link. Sealed with a memory -- Was there something that ingrained this album into your being in your past? See numbers 16-20 at this link. Apart from an early musical venture into punk and metal that included The Misfits, Samhain, and Danzig (see a trend? ), I generally tended towards the "alternative/pop" side of music. When this album came around, it was a healthy progression into this off-shoot of alternative/industrial music for me. In my opinion, it is the best overall album by NIN, and I can play it in my car in my 30's without someone at the stop-light wondering why they are hearing about f-ing like an animal. 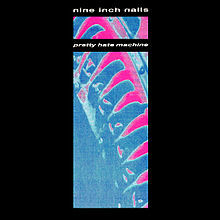 (as on another NIN album) Strong, strong debut album that still holds up as an all-time great. Music -- Trent Reznor brought (previously thought-of) lame creepy industrial music to the masses. His haunting melodies and vocals are fantastic. Awesome Songs -- "Head like a hole" is such a great album-starter. Immediately crank the volume up. "Terrible lie", "Sin", and then it cap it off with one of the best songs by NIN..."Ringfinger". Love it. Memory -- None of my friends really liked this band like I did. I was a closet NIN fan. I know my Mom didn't like them either. To climb into my "top 5 bands" or "top 20 albums", there needs to be a little bit of "staying power." Even though Muse hasn't proven this over my musical lifetime (yet), they deftly overcompensate with some of the best music I've heard in years. I LOVE this band. Wild Card -- My brother may like this band more than I do...and he "discovered" them first. This makes me angry. I also hate that the author of Twilight used this music as her inspiration for her books. 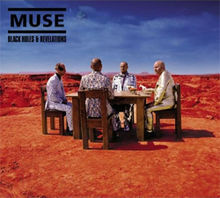 It soils Muse's good name. I never boarded the U2 train with Joshua Tree. I stayed away when the masses clamored for Rattle and Hum. Why were these Irish dudes singing folksy music? I was confused and never latched on. Achtung Baby came and I immediately joined the ride. The Euro sound was much more to my liking. 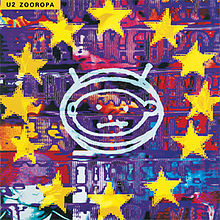 Zooropa felt like a transition album to me. U2 was at a cross-roads. They were the most popular band in the world, trying to decide if they should stick with their "pop-like" ballads, or continue down the much more interesting path of the Achtung baby roller coaster. Lucky for us...they chose the latter. Zooropa is so much in one album. Electronica, heavy bass beats, soulful ballads, and the Edge monotonically singing one of the best songs to be released in years. The guitars were more vibrant, the drums more random, and the entire album left you exhausted by the end. That's what I want in an album. Unfortunately, in subsequent albums, U2 regressed back to top-40-esque music and blase sounds, to be re-mixed into tunes heard in elevators and shopping malls for years to come. Music -- I already mentioned above how much I liked this "awakening." I wish they could have stayed the course. The only exception is the awkward last song with Johnny Cash. I love the Man in Black, but I don't like this song. Awesome Songs -- I love "Numb" so much it pains my innards. "Stay" is fantastic as well. Wild Card -- I only saw U2 once in concert. (the popmart tour) The seats were horrible, and the tickets were over-priced. I loved every minute of the production. Rarely does a music album come with such force, that it forever changes the trajectory of music. Unfortunately, this isn't that album. (that honor goes to Nirvana's Nevermind) But...this album took the heavy momentum from Nevermind, and pushed it into another orbit. Grunge became mainstream. I don't want to over-state how important this was in the annals of musical history. For a decade, Americans were subject to the worst social/musical trend ever created. We know this as Heavy Metal. Now now dear Warrant fans--there were some quality groups in this period. The cream of the crop as some may say. Guns n Roses, Motley Crue, etc. (Metallica is in a class of their own) But for every "top-tier" heavy metal group, there were dozens of lycra-clad, big-hair, STD-infected, screaming hard rockers. (I'm talking about Raven, Twisted Sister, Quiet Riot, Winger, Dio, Ratt, Poison, etc) If this lifestyle were allowed to continue, VH1's Rock of Love wouldn't be a complete joke/farce, and Tommy Lee would be President. Music -- Ground-breaking. Countless bands tried to imitate and replicate their sound. Most to no avail. Awesome Songs -- "Once" is by far my favorite, but there really isn't a let-down on this whole album. Memory -- Every 16 year old boy at this time felt that Pearl Jam spoke for them. 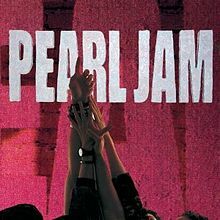 We felt that Vedder could do it better with music than we could with words....oh...until I found out that he was singing about suicide on their most popular song. That kind of dampened the whole "speak for me thingy." Wild Card -- Does Eddie Vedder have lazy eye? I understand the whole "vein" popping out while he's struggling to hit high notes, but the lazy eye at key moments of songs really creeps me out. Franken-Vedder. Speaking of 80's niche bands.....Depeche Mode sort of started out this way. At one time, they were clustered in with other 80's soft alternative bands like the Cure, Echo and the Bunnymen, and the Smiths. Unlike the bands listed previously, Depeche Mode continued into the 90's with many more fantastic albums. 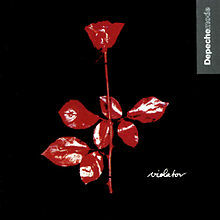 Violator separated the band from its peers into the subconscious of everyday radio play. Everybody liked this album. Music -- While not amazingly different from their other albums, there isn't a let-down of quality music. I love David Gahan's voice. Awesome Songs -- "Sweetest Perfection" is a fantastic song. "Waiting for the Night" also tops the list. Memory -- I saw this band in concert in the 2000's after their heyday. They sound better live than 95% of most bands alive. Wild Card -- 9 songs??!! Really?? This album only has 9 songs. This is outright ludicrous. Is this where Coldplay gets the idea to crank out 32 minute albums?